FOR THOSE who find themselves at the end of the weekend, but not quite ready to face the thought of having to go back to work or school Monday, 'there's a really unique program featured late Sunday night on WTTW-TV (Channel 11, Chicago) that can make facing the week ahead just a little easier. Dr. Who, a British-produced science fiction series, is one of the most fast-paced, adventurous and humorous programs to be found anywhere on television. The show is a little different than what American sci-fi audiences are accustomed to. The state-of-the-art special effects featured in films like Star Trek, Star Wars and Close Ecounters won't be found on Dr. Who. But what the show lacks in budget, It more than compensates lata excellent scripts, class acting add highly imaginative directors whip make Dr. Who one of public television's most popular shows. 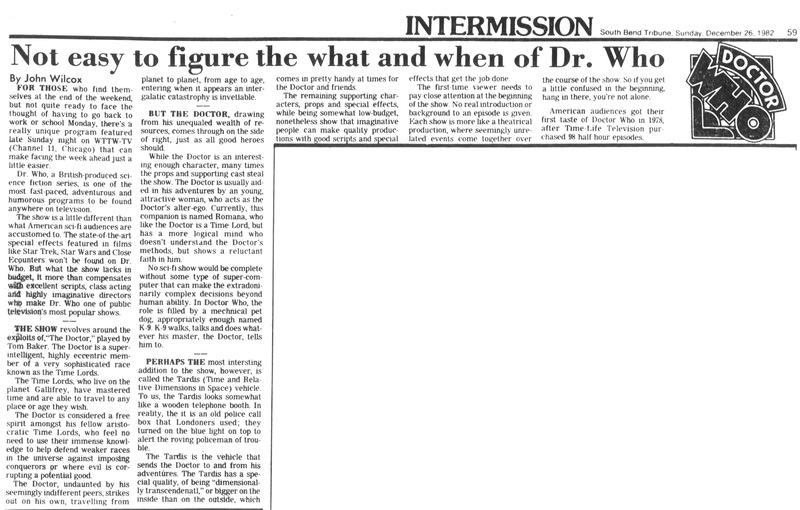 THE SHOW revolves around the exploits of, "The Doctor," played by Tom Baker. The Doctor is a super-intelligent, highly eccentric member of a very sophisticated race known as the Time Lords. The Time Lords, who live on the planet Gallifrey, have mastered time and are able to travel to any place or age they wish. The Doctor is considered a free spirit amongst his fellow aristocratic Time Lords, who feel no need to use their immense knowledge to help defend weaker races in the universe against imposing conquerors or where evil is corrupting a potential good. The Doctor, undaunted by his seemingly indifferent peers, strikes out on his own, travelling from planet to planet, from age to age, entering when it appears an intergalatic catastrophy is invetiable. BUT THE DOCTOR, drawing from his unequaled wealth of resources, comes through on the side of right, just as all good heroes should. While the Doctor is an interesting enough character, many times the props and supporting cast steal the show. The Doctor is usually aided in his adventures by an young, attractive woman, who acts as the Doctor's alter-ego. Currently, this companion is named Romana, who like the Doctor is a Time Lord, but has a more logical mind who doesn't understand the Doctor's methods, but shows a reluctant faith in him. No sci-fi show would be complete without some type of super-computer that can make the extradoninarily complex decisions beyond human ability. In Doctor Who, the role is filled by a mechnical pet dog, appropriately enough named K-9. K-9 walks, talks and does whatever his master, the Doctor, tells him to. PERHAPS THE most intersting addition to the show, however, is called the Tardis (Time and Relative Dimensions in Space) vehicle. To us, the Tardis looks somewhat like a wooden telephone booth. In reality, the it is an old police call box that Londoners used; they turned on the blue light on top to alert the roving policeman of trouble. The Tardis is the vehicle that sends the Doctor to and from his adventnres. The Tardis has a special quality, of being "dimensionally transcendenatl," or bigger on the inside than on the outside, which comes in pretty handy at times for the Doctor and friends. The remaining supporting characters, props and special effects, while being somewhat low-budget, nonetheless show that imaginative people can make quality productions with good scripts and special effects that get the job done. The first-time viewer needs to pay close attention at the beginning of the show. No real introduction or background to an episode is given. Each show is more like a theatrical production, where seemingly unrelated events come together over the course of the show. So if you get a little confused in the beginning, hang in there, you're not alone. American audiences got their first taste of Doctor Who in 1978, after Time-Life Television purchased 98 half hour episodes. APA 6th ed. : Wilcox, John (1982-12-26). Not easy to figure the what and when of Dr. Who. South Bend Tribune p. 59. MLA 7th ed. : Wilcox, John. "Not easy to figure the what and when of Dr. Who." South Bend Tribune [add city] 1982-12-26, 59. Print. Turabian: Wilcox, John. "Not easy to figure the what and when of Dr. Who." South Bend Tribune, 1982-12-26, section, 59 edition. This page was last modified on 11 February 2019, at 02:52.